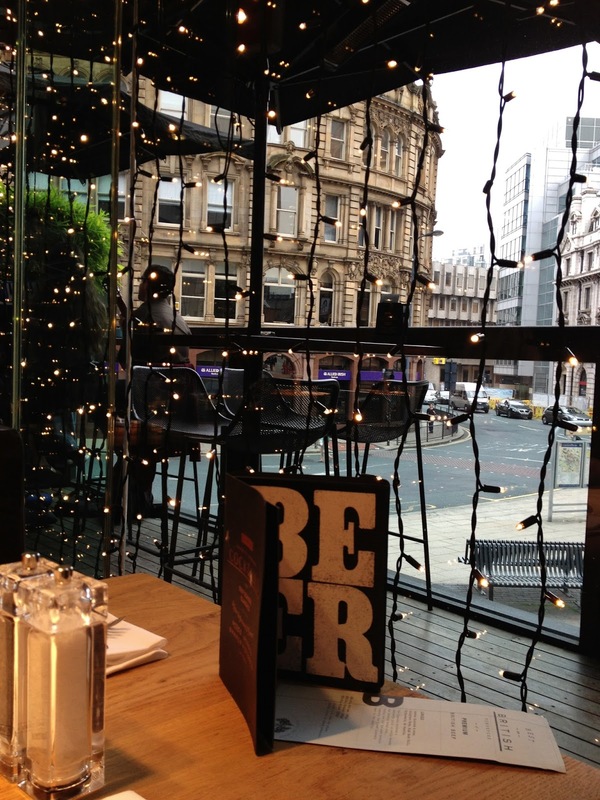 Blackhouse sits on East Parade Leeds in the former location of Est Est Est. I hadn't eaten at either of these restaurants until last Friday... as Est Est Est is no longer there it's pretty obvious that I went to Blackhouse. Myself and S decided to visit when we had finished work last Friday as a post work treat to start the bank holiday weekend. 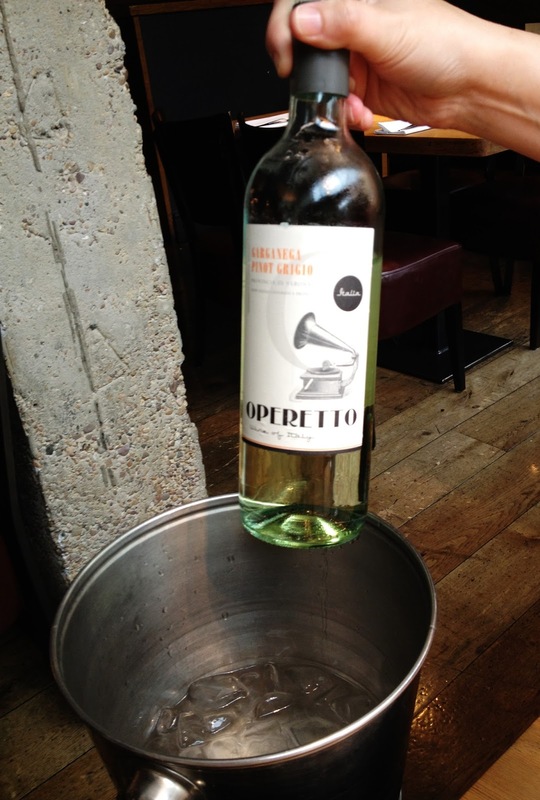 After a few recommendations from the waiter I finally decided upon the Operetto Garganega an Italian Pinot Grigio. It was light and refreshing; great for a summers evening, I also quite liked the 1920's style label - very Gatsby and on trend at the moment. 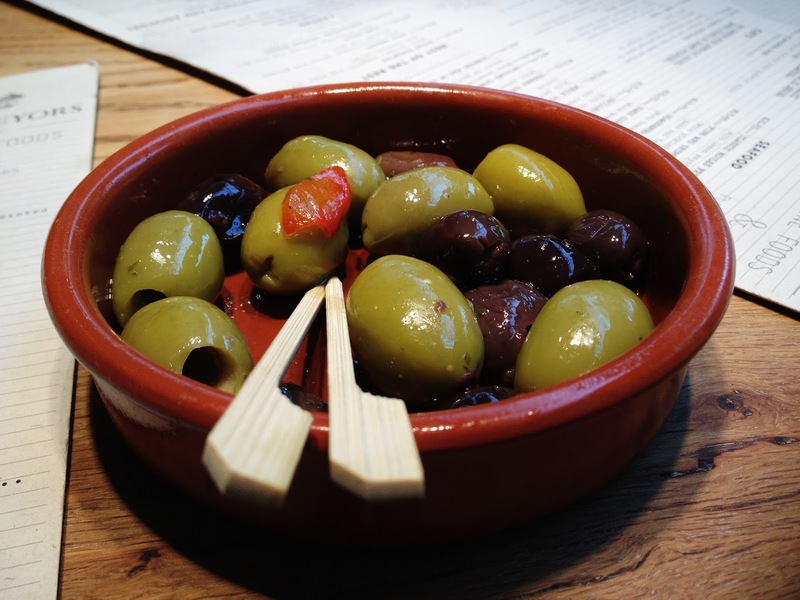 Whilst debating what to order we requested some olives. To be honest... I was expecting more in a bowl for a price tag of £3 but the ones that were there were delicious. I particularly liked the non-cocktail sticks they came with. Once we had finally decided which starter to choose, there were so many we fancied it became a justifying match to choose the final one. For instance, which one would allow us to still fit in dessert, which one would complement a steak main, which one was worth the money... etc. 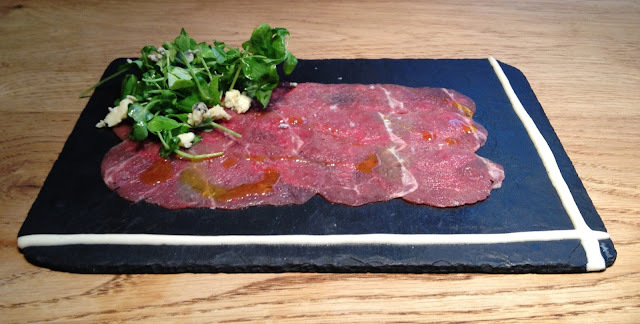 In the end S went for the Beef Carpaccio. Thinly sliced pieces of seasoned beef, cress topped with Stilton and (at a guess) a fish sauce decorating the edge. I have recently learnt that some people hate meals served on slate... to be honest I thought the slate looked quite nice on this occasion, the sauce framed the meat and salad creating a very picturesque dish. For my starter I decided to go for the baked Camembert. 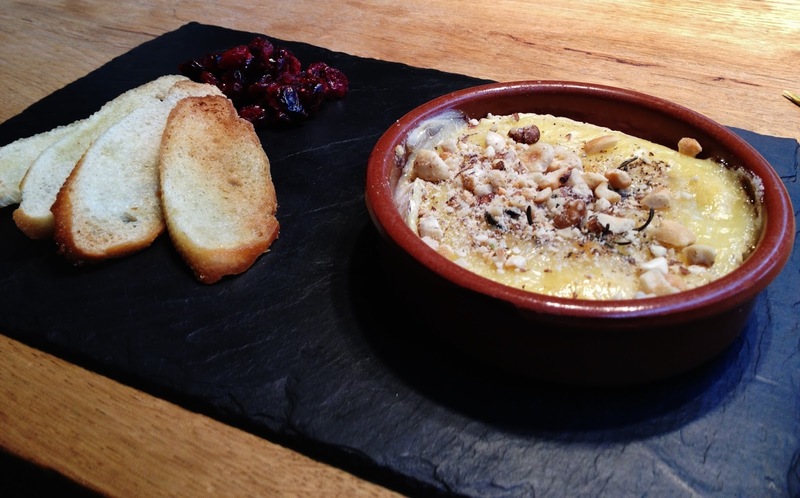 The Camembert is topped with crushed nuts and served with bread crisps and dried cranberries. A nice touch was the waiter providing me with some more bread before I was nearing the end of them, he must have noticed I still had some gooey cheese left to eat. It all blended perfectly and I wasn't left feeling too sickly once I had finished it either, a perfectly sized portion. For mains clearly we were going to have steak, it's what I had heard those who had raved about the place... well... rave about. S decided to go for the Ribeye with champ potatoes. For those who are unsure what champ potatoes are (which we were admittedly) they are new potatoes smashed with herbs butter and garlic - they looked great. The Ribeye comes in two sizes 225g and 310g, thinking of dessert S when for the 225g. S had her steak medium rare, there were a lot of 'mmmms' and 'aaahhhs' coming from across the table so I am assuming she liked it! 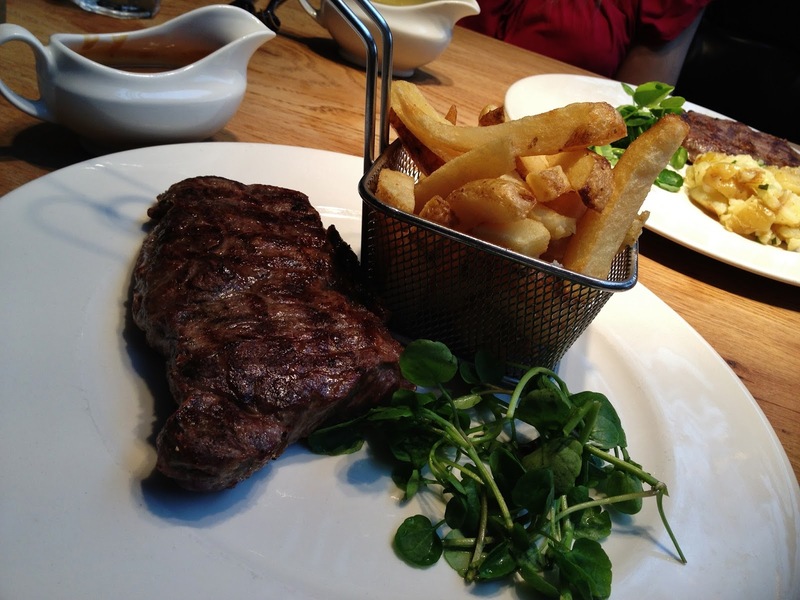 I decided to go for the Sirloin steak served medium with chips (Cue the chip test!). The sirloin is aged on a bone and served in 280g portions and to be honest I think I could have had it a little rarer... not because they overcooked it, I think it might be instead my taste-buds maturing. The steak was SO AMAZING!! I haven't eaten steak as good as this ever, again this may be because I have previously been ordering medium to well done or go back a few more years... well done. Seriously what was I thinking?! I don't think I was. I just presumed I wouldn't like blood all over my plate - turns out it's really not that bad. Anyway... back to the steak, it was melt in your mouth, there was barely any chew and barely any fat either. The chips... the first chip I ate was undercooked. I feared that the rest of my meal would be tainted by bad chips... but fear not! It was just one undercooked chip, the rest were fine. When I say fine - I mean fine, they were well seasoned and well portioned but they weren't the greatest chips I have ever had. The basket thing is another fad at the moment, but in this case it actually worked well as it kept my chips free from getting too soggy in the blood and beef juice. I ordered the peppercorn sauce and S the Bearnaise, they came in tiny gravy pourers skin free. Blackhouse also served Wagyu steak. 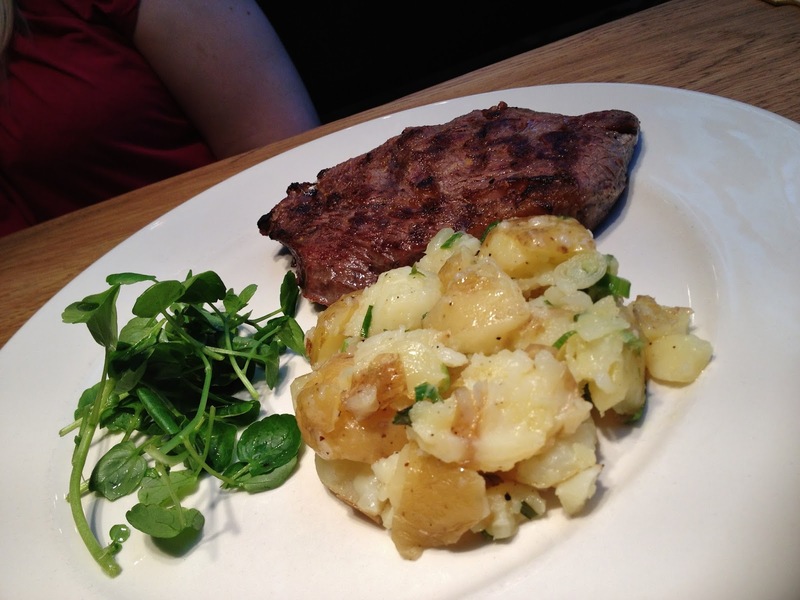 The cow this steak originates from is massaged from birth and fed on beer! Jeeeez this cow has a better life than me... sort of. I hope I don't get slaughtered and served up as steak. At £55 a pop it isn't cheap!!! I would be intrigued to try it... but that wont be any time soon! We decided to take a short break between our mains and ordering dessert, plus the wine had started to go to our heads by this point and we were gabbing on too much to pay attention to the dessert menu. 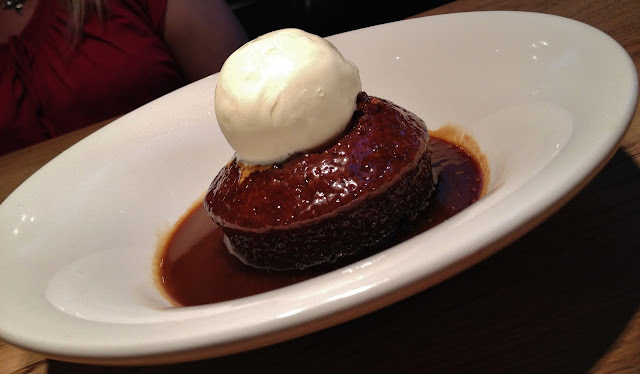 S ordered the sticky toffee pudding as recommended by another who had visited prior. Served warm with vanilla ice cream I took a sneaky bite, it was so moist and not stodgy at all. 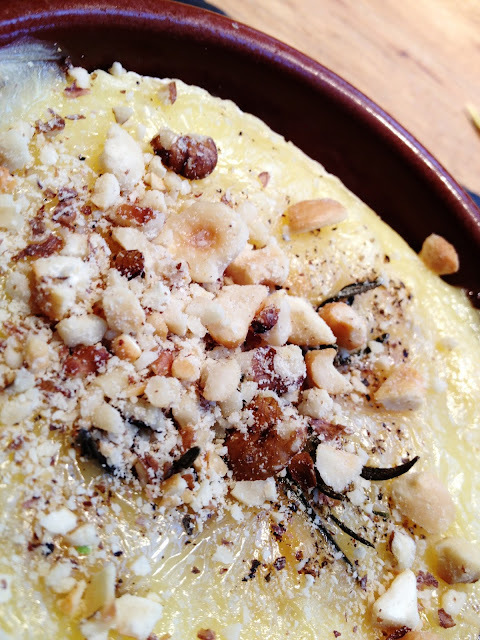 After a big dinner this certainly wouldn't be a big effort to eat. 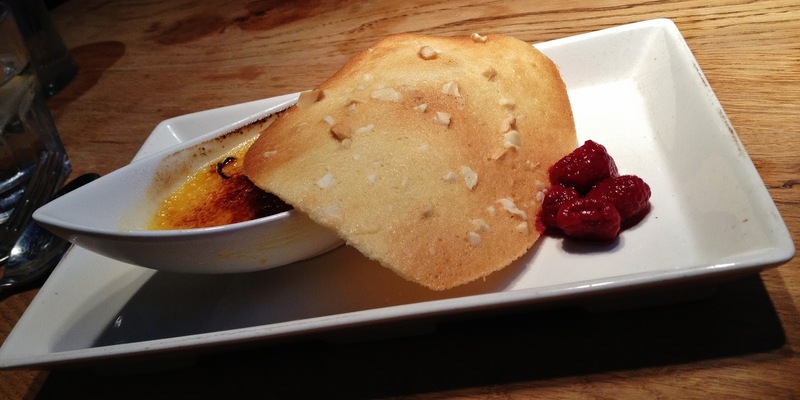 I decided to order the Creme Brulee, served with a cashew nut tuille and raspberry compote (four soggy raspberries). Everything about this was perfect, I quickly devoured the lot, with S remarking it was the fastest she had seen me eat all night! The service was impeccable. The waiter (handsome and charming) topped up our wine before our glasses were even nearing empty, and patiently helped us with the menu and his recommendations. Edging towards 8pm the restaurant started to fill but the atmosphere remained relaxed and it wasn't overly loud or full for a Friday night which was nice. For a three course meal and a bottle of wine the total price of the meal came to about £100. 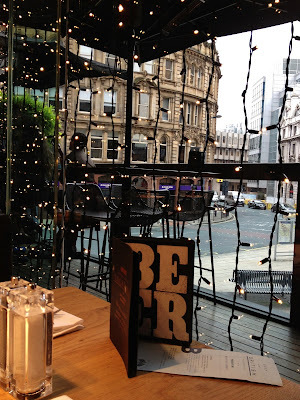 I really enjoyed my night here, and even recommended to our Christmas-party-organiser that we consider it for our department's Christmas meal this year. I will definitely be looking out for any special offers they have available too.